An ice cream sandwich that you don’t need an ice cream machine to make. As a native San Franciscan, I’m proud to say that my first encounter with an ice cream sandwich was with the It’s It, the iconic treat invented here way back in 1928. In our freezer at home, my Dad would often stash a few of those big-fisted oatmeal cookie sandwiches filled with vanilla ice cream and dunked in chocolate. As a kid, I couldn’t even eat an entire one at one sitting. I’ve been a sucker for ice cream sandwiches ever since. So when a review copy of “Ice Cream Sandwiches” (Ten Speed Press) landed in my mailbox recently, I leafed through it with the utmost nostalgia. The book is by Donna Egan, founder of the Buttercup Cake Shop, London’s first cupcake bakery. After opening in 2006, the bakery added ice cream sandwiches to its repertoire five years later and has never looked back. 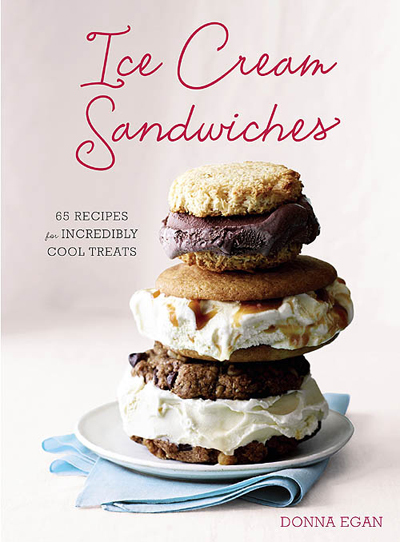 The book features 65 recipes for all manner of ice cream sandwiches. The “Peanut Butter Dream” caught my eye because, well, who doesn’t love chocolate and peanut butter together? The cookies are actually thin brownies. The recipe calls for using 90 percent cacao chocolate. 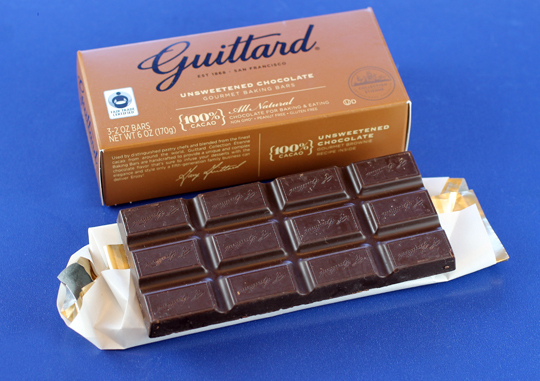 But I made them even more chocolaty by using the new Guittard 100 Percent Cacao Unsweetened Etienne Baking Bar (three 2-ounce bars for $6.99), of which I recently received a sample. The chocolate is deep and dark with an almost coffee-like bitterness that gives way to a subtle floral quality. Guittard’s new Etienne Baking Bars. The beauty of this particular recipe is that you don’t even need an ice cream machine to make this “ice cream” sandwich. That’s because the filling of peanut butter, cream cheese, sugar, and vanilla is blended together before whipped cream is folded in to lighten its texture. It’s pliable enough so that you don’t need to freeze the brownies beforehand to make sure they can support the filling, either. Instead, once they’re cut and cooled, just go ahead and spread on a thick smear of the filling, before topping with another brownie to make your sandwich. Freeze for about two hours, then serve. 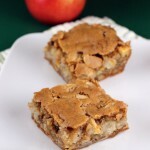 In fact, these are a perfect treat to make ahead of time for a summer soiree, too. The brownies firm up in the freezer, but still have a nice chewiness to them. The filling ends up creamy and more like a frozen mousse than ice cream that’s had air incorporated into it. And funny enough, I had no problem whatsoever finishing a whole one of these babies. Bake the brownie base as directed in the recipe below, remembering to cut it as soon as it’s out of the oven. Meanwhile, whip the cream in a small bowl until fluffy and set aside in the refrigerator. In a separate bowl, beat together the cream cheese, peanut butter, sugar, butter and vanilla until smooth. Fold the whipped cream into the peanut butter mixture until no streaks remain. Once the brownies are completely cool, arrange half of them bottom side up. 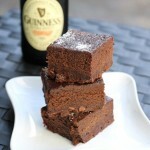 Spread the desired amount of filling onto the bottom of 1 brownie, spreading it within 1/4 inch of the edges. Top with a second brownie, bottom side down, and press gently to spread the filling evenly to the edges. Repeat with the rest of the brownies. Place in airtight plastic containers and freeze for at least 2 hours before serving. Preheat oven to 350 degrees. Lightly grease a 15- by 10- by 1-inch jelly-roll pan. Or alternately, line the bottom and sides of the pan with a piece of aluminum foil with enough overhang to act as “handles” to lift the entire brownie out of the pan after baking. Grease the foil. Put the butter and chocolate in a heatproof bowl. Microwave on 70 percent power for 1 minutes. Stir together and repeat until completely melted. Alternatively, you can melt the two ingredients in a heatproof bowl set over a pan of simmering (not boiling) water, stirring until melted. Add sugar to the chocolate mixture and stir. Allow to cool slightly, then add the eggs and vanilla, stirring with a fork until completely incorporated. Add the flour and salt and stir until just incorporated. Spread the batter evenly across the greased pan, using an offset spatula or the back of a spoon to ensure it is evenly distributed. Bake for 10 to 12 minutes. The center should be firm but still slightly moist and the edges may start to pull away from the sides of the pan. Do not overcook. Remove from the oven and cut with a knife or use shaped cutters immediately, while it is still hot. 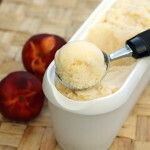 Allow to cool before filling or storing in an airtight container. 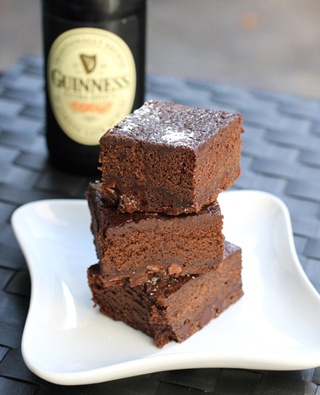 Tip: Using chocolate with 90 percent cacao makes these brownies really dark and chocolaty. If you can’t find it and your chocolate has a lower percentage, add 2 tablespoons cocoa powder in place of the chocolate and reduce the sugar by 2 tablespoons. I’ve never seen a brownie that thin, but makes sense for an “ice cream” sandwich. I can’t remember if we had It’s Its growing up in Hawaii. I know there was this vanilla ice cream sandwich with a thin chocolate wafer that was mass produced, and I always like eating off part of the chocolate wafer on both sides so I just have this stick of vanilla ice cream, and would bite into it like eating a stick of butter! Ha! Gosh I miss those It’s Its. Are they still around?? This sounds like a really tasty & alternative cook book! 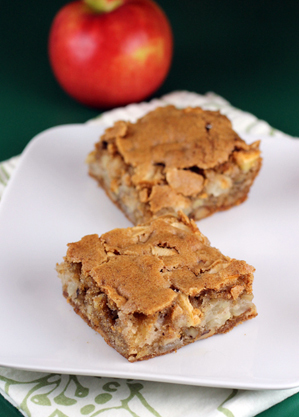 I love this tasty & filling dessert recipe a lot! The PB filling & the chocolate cookies look amazingly beautiful! I do need these for this long weekend! 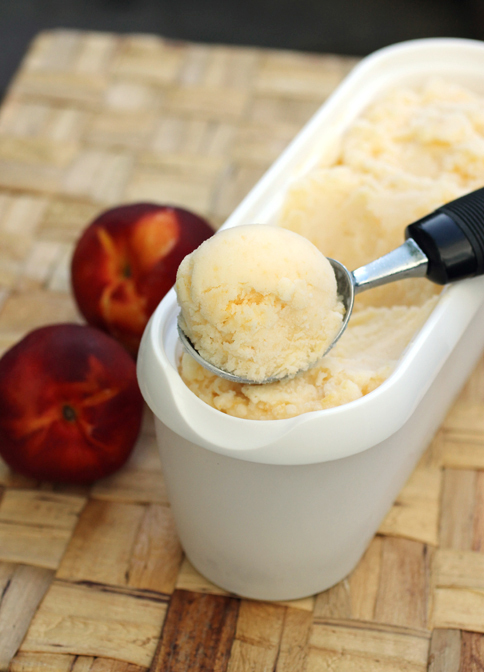 What a great combo, and I love the idea of a no-churning-necessary ice cream. Never heard of It’s It, but it sounds terrific. 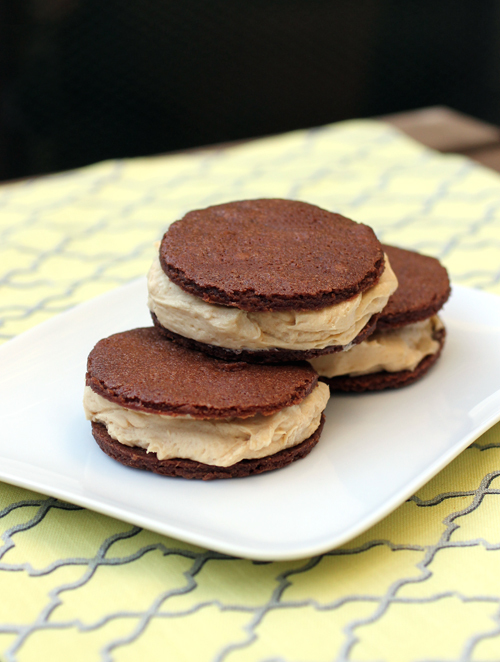 As do these great peanut butter and chocolate ice cream sandwiches. Great combo of flavors, and ice cream sandwiches are always fun to eat. Have a great Labor Day! Oh these look so delicious! I saw Guittards home office one day when I was in Fairfield, It was close to the Jelly Belly factory. Oh what wonderful treasures there are in Northern California!! Good golly, I have to make ice cream sandwiches! That must be one of my younger son’s favorite things ever when he goes to the US and we always eat through boxes of them. It would be nice to have them here in France! And yes to no-machine peanut butter ice cream! the ice cream sandwich novelties of my childhood have nothing on this!